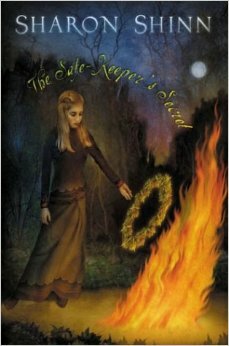 This is the first book in the series, though I read it after having read the second book, THE TRUTH-TELLER’S TALE. There were some spoilers involved with having read the books in this order, so even though it’s possible to read them out of order I do recommend reading them in order. Even so, I don’t think it really impacted my enjoyment of the story, even if the big reveal at the end was something I had already know about due to my accidental out-of-order reading. Even though I knew more than I should have, though, the story itself was quite interesting and enjoyable. I loved the way the characters developed, and it was enjoyable learning more of the world than I had seen in the other book. It seems that each book is mostly focused on one town, with possible small excursions into neighboring towns, and since each town is different, different parts of the world are revealed in each. Also, this book is set a bit before the second book, so while there are some characters that overlap, they are a good deal younger in this book than the next. The plot, too, is fun. There is no real “bad guy” in this book (it doesn’t appear that there’s a true villain in any of the books of the series, for that matter), but the situation provides sufficient conflict for the story. It is a bit slower-paced than a lot of fantasy-adventure books, though. Come to think of it, I wouldn’t label this as an adventure book. A coming-of-age story, perhaps. It has hints of mystery (the whole fact that there’s someone who’s JOB is to KEEP SECRETS hints at mystery), but it isn’t a traditional mystery novel either. I do recommend this book. This feels like the kind of book that I should have read when I was younger and be RE-reading now, but it’s still good for adults. It just has the atmosphere of the kind of books I read in my school years. For Wyverns, Writing and Weirdness!